PR Newswires – Are they Worth It? 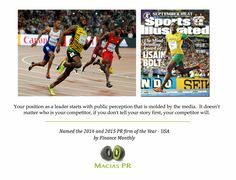 By Mark Macias Clients are always asking me what I think of press releases posted on the PR newswires. “Why can’t we just write a press release and post it on PRWeb or PRNewsWires? WHEN IS A PRESS RELEASE VALUABLE and WHEN IS IT A WASTE OF MONEY? Press releases can be an element of a larger media strategy, but they won’t get you on the media radar.